This breakfast smoothie is a powerhouse of nutrients that make it ideal for consuming after an early morning workout. It contains almond milk, oats, Medjool dates, chia seeds, flaxseed, peanut butter, cinnamon and frozen banana which all work in tandem to repair joints and muscles, whilst giving an important nutrient boost that will get your day started in the best possible way. Providing a low-fat, dairy-free base to this breakfast smoothie, almond milk has a number of health benefits that include reducing the risk of heart disease, improving your body’s ability to use energy from carbohydrates and assisting with weight loss. Purchasing commercially produced almond milk, which is usually fortified with vitamins and minerals, will ensure that your body gets a good dose of important nutrients like vitamins A, D and B12, as well as calcium and potassium which are essential for maintaining bone health. The benefits of adding oats to your breakfast smoothie are numerous. They contain antioxidants that are unique to them called avenanthramides which have been shown to reduce the risk of developing cardiovascular disease, by preventing damage caused by free radicals released by “bad” cholesterol. The levels of dietary fibre in oats is also known to lower bad cholesterol and help you feel satiated for longer, which aids in maintaining a healthy weight. Dates are often used as a natural sweetener in the recipes of many health-conscious individuals and they are used as such in this breakfast smoothie. However, Medjool dates don’t just provide a delicious sugary kick, they also have a number of benefits to your health including improving iron deficiency, reducing the risk of stroke and maintaining bone health. Chia seeds are going to add an awesome nutrient kick to this breakfast smoothie. They are incredibly rich in omega 3 and 6 fatty acids, which are essential for good brain development and heart health. They also contain very good amounts of phosphorus, calcium and manganese. The health benefits of chia seeds include reducing inflammation, keeping blood sugar in balance and lowering the risk of cardiovascular disease. Adding flaxseed in combination with chia seeds guarantees a boost of essential omega fatty acids that are important for good health. Flaxseed is also high in dietary fibre which is very good for helping you to feel satisfied. Some of the health benefits associated with consuming flaxseed include reducing the risk of heart disease, fighting against cancer and lowering blood pressure. 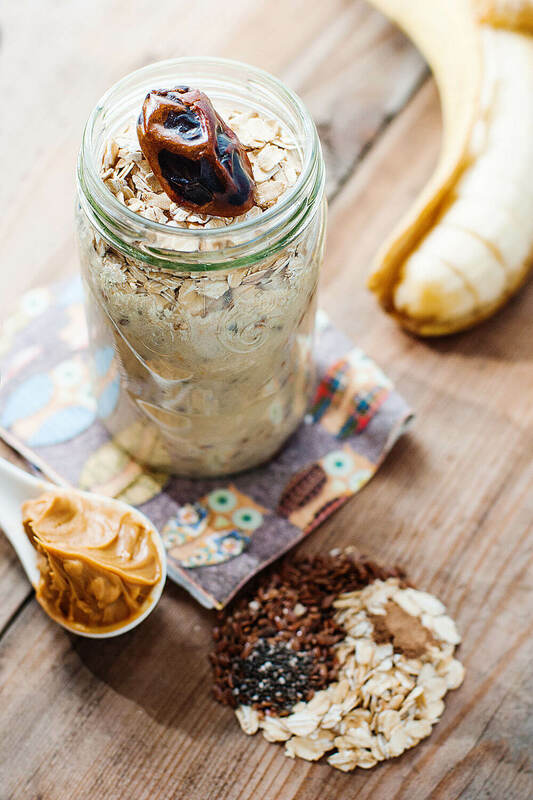 Peanut butter makes a perfect addition to this protein-rich breakfast smoothie because it not only helps increase the overall protein content, but the oils it contains are understood to help prevent diabetes, Alzheimer’s disease and gallstones. Peanut butter is also rich in potassium, which is essential for maintaining good heart and bone health and its fibre content assists in maintaining a properly working digestive system. Cinnamon will not only make the smoothie taste delicious, but will also help to reduce instances of inflammation both in the joints and in cell membranes. The latter usually leads to conditions such as cardiovascular disease. Having cinnamon combined with the protein from other ingredients means that you have an excellent post-workout meal that will help your joints and muscles heal more quickly. Bananas provide a boost in potassium, which is good news for bone health. They also work with the oats to thicken the overall smoothie mixture and give it a more milkshake-like texture. Bananas provide a number of health benefits that include increased production of white blood cells, reducing swelling and helping to maintain a healthy weight.